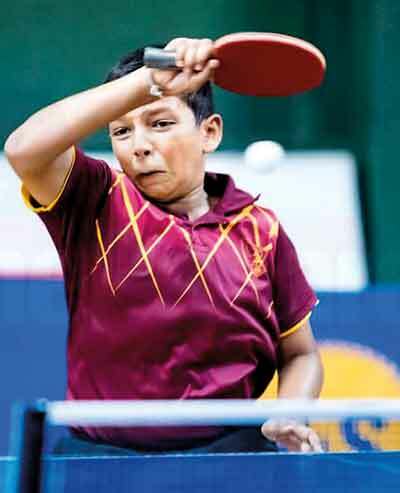 Anandian Senura Silva, ranked number one Under-12 paddler brought credit to his motherland and alma mater when he won a bronze medal at the Indian Junior and Cadet Open, International Table Tennis Federation Premium Junior Circuit tournament concluded at Greater Noida, India on November 1. Young Senura’s achievement winning a bronze medal is the first ever International Hopes medal won by a Sri Lankan for Table Tennis. Earlier this up and coming paddler participated in the Thailand Junior World Open this year and reached to top eight players and he fought his way to best his performance and grab a medal for Sri Lanka. In the Hopes Boys’ Singles second quarter-final Senura defeated Sheth Ved of USA and went down fighting in a tough semi-final against Suresh Raj of India losing 2-3. Another Sri Lankan Mahith Jayasumana lost to Divyansh Srivastava of India in the third quarter-final clash.